Design your own iPad slip case in your style and make a personalised iPad cover with a photo, design or text. Create handcrafted to customised iPad cases for a gorgeous look and feel for all iPads. Superbly made, with protective neoprene. Made to order, hand crafted and printed photo iPad cases, sewn in London. 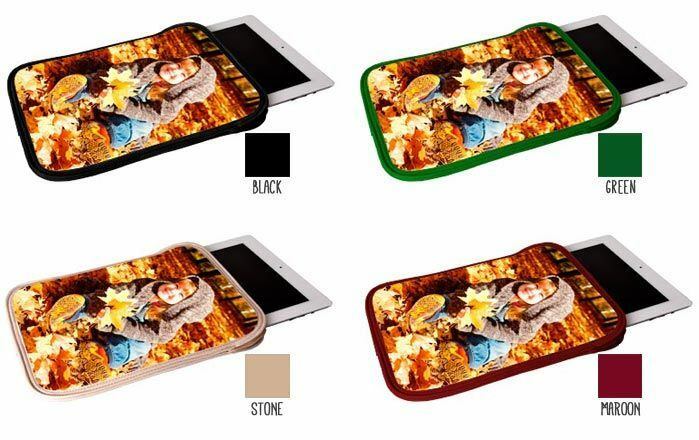 Print your photos on custom-made photo iPad case. Press star design and design yours. Also available with montages using our collage app. Quality is good very clear reproduction of my photos. Kept well informed of progress and when production dispatched. This is the second time that I have purchased items from Bags of Love. The apron, cushion ordered previously and the iPad case which was ordered a short notice for a Christmas gift have been fab. Customer service is excellent. Would definitely use Bags of Love again and have already recommended them to friends and family. Design process simple. Delivery Fast. Product quality excellent. We can offer you a wholesale discount on your iPad case if you are planning to place a bulk order. To receive more detailed information, please contact the lovely customer service team. They can assist you with all questions you might have about the wholesale discount and the product itself. Our personalised iPad case is made from classic wetsuit material and finished with black ribbon binding and a tidy zip. There are no straps or handles but it closes fully with a neat zip. This fabulous case fits all iPad versions. We also make the iPad Mini case here. Make a photo iPad case using our online preview designer to see before you buy. Our custom iPad case is dispatched fast as standard but is often made and dispatched same day. It's great to customise your own personal device with lots of creativity, from patterns on the cover to designing a photo case. Your photographs printed on the wet suit material and then sewn into a photo iPad case. Look after your precious device in style with our personalised iPad soft cover. Create photo iPad cases made by hand with cushioning wet suit material for good protection. When you choose your photo please bear in mind that approximately 1cm of the photo print is stitched into the iPad fabric case on all four sides, so be sure to avoid any key subjects at the very edge of the photo. Our cases are a rectangle to snugly fit the iPad so you can add a rectangle or landscape photo and rotate the bag to view. Make your own iPad case with your photo in our custom designer preview, and get to choose a colour binding choice too.